There is a beautiful exhibition of the work of David Hockney now up at the Metropolitan Museum of Art in New York City through February 25th and I highly recommend it. The renowned British artist is now in his 80th year and this retrospective highlights his greatest work over the last 50 years. It's so interesting to view it because one can see, from the very beginning in the Sixties, the themes that run through Hockney's painting - the signature pink and green and blue colors, depictions of water and swimming pools, a chic take on people, and a robust sensuality. He's been consistent. I've always been a fan of David Hockney's. Many years ago my friend Jim Reginato took me to a party when the artist had a new book out. I bought the book and I wanted Hockney to sign it for me but he was being monopolized by a woman photographer who shall go unnamed. Jim said to me, "Go interrupt them and ask him to sign it. That's what book parties are for." But I didn't and regret it. I wish I had a signed book! New York City is not a place for shy people. Hockney went to art school in London and then moved to L.A. where he was taken with the nice weather and the beautiful people. With Hockney's work you get happy colors and a joy for living. You can almost feel the warm air. These same colors move inside too with Hockney's large double portraits. Here is on the right Christopher Isherwood, who wrote The Berlin Stories, upon which Cabaret was based, with his younger boyfriend painter Don Bachardy on the left. 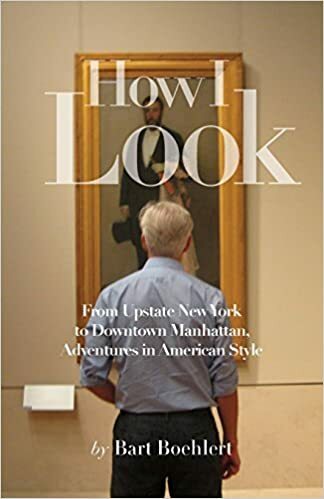 Interesting how Isherwood is looking at Bachardy and Bachardy is peering out at the viewer. 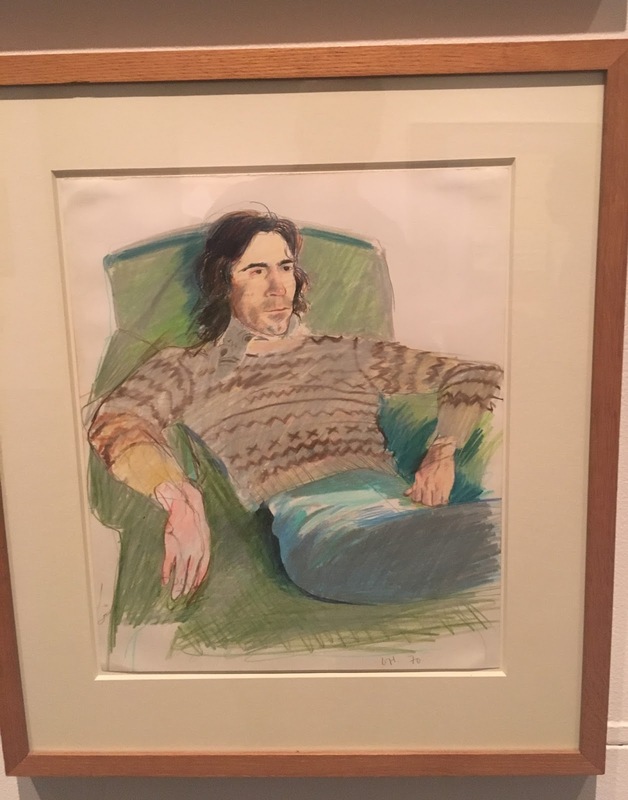 This is a small drawing of Hockney's friend the fashion designer Ossie Clark looking chic in a Fair Isle sweater. Summer version of the English landscape - earthy, rich and ripe. This scene reminds me of the farms of upstate New York where I grew up. 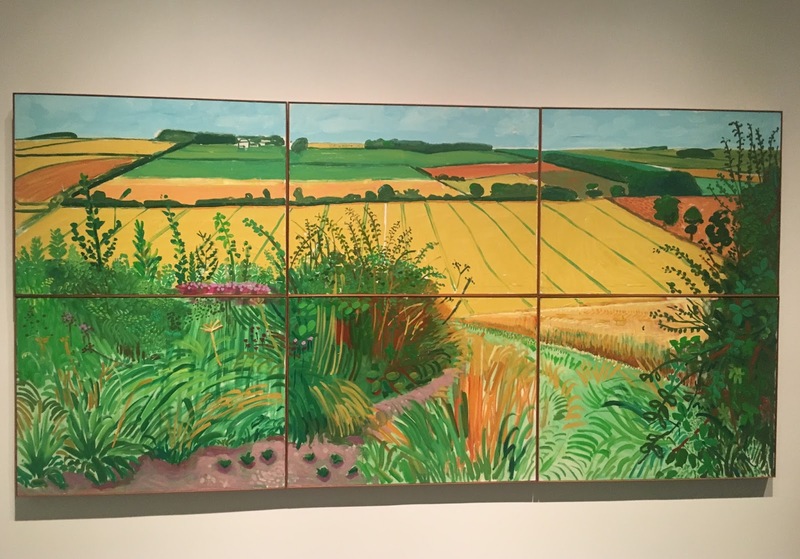 These paintings were broken into six panels so that Hockney could easily transport them. Hockney has moved back to L.A. and is still painting pictures of his residence there. This exhibition makes you want to go home and paint your walls pink and your floors blue. If you lived with one of these paintings you'd always be happy. Long may Hockney reign.